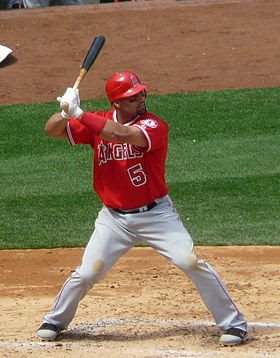 Albert Pujols play of the day! Manny Machado is 14 for 32 (.438) while hitting safely in all seven meetings against Boston. Carlos Beltran, who is 4 for 7 with two doubles, a triple and a homer VS Minor. Billy Butler is batting .412 (13 for 34) over his last nine games. Troy Tulowitzki is batting .395 in 32 career contests against the Brewers with 10 home runs and 28 RBIs. Martin Prado, 6 for 17 off Stults, should be available after he was shaken up on a headfirst slide Thursday. Prado is batting .353 with five doubles against Padres pitching this season. Everth Cabrera is 14 for 35 with two homers and seven RBIs in the season series VS Arizona. Albert Pujols kept his recent hot streak going with three hits and two RBIs last night. He's batting .352 with four homers and 13 RBIs over a 14-game stretch. Dustin Ackley is 4 for 8 with a homer off Diamond -- all last year -- has hit safely in all seven career home games against the Twins. He's batting .462 (12 for 26) in those contests after going 3-for-4 with two RBIs on Thursday.